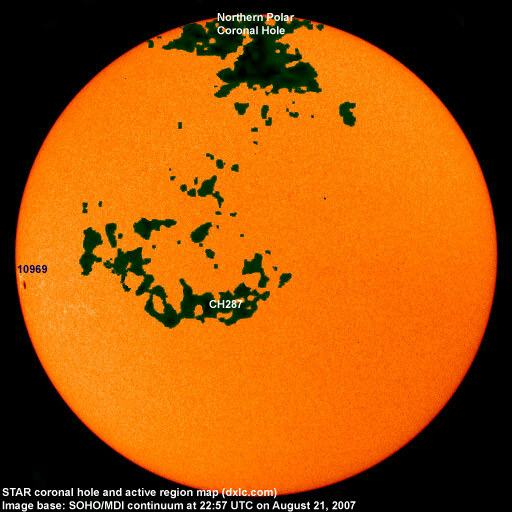 Last major update issued on August 23, 2007 at 05:20 UTC. The geomagnetic field was quiet on August 22. Solar wind speed ranged between 308 and 351 km/s (average speed was 339 km/s, increasing 8 km/s over the previous day). Solar flux measured at 20h UTC on 2.8 GHz was 70.0. The planetary A index was 4 (STAR Ap - based on the mean of three hour interval ap indices: 3.5). Three hour interval K indices: 01012111 (planetary), 01122111 (Boulder). Region 10969 was mostly quiet and stable. August 20-22: No obvious fully or partly Earth directed CMEs were observed. 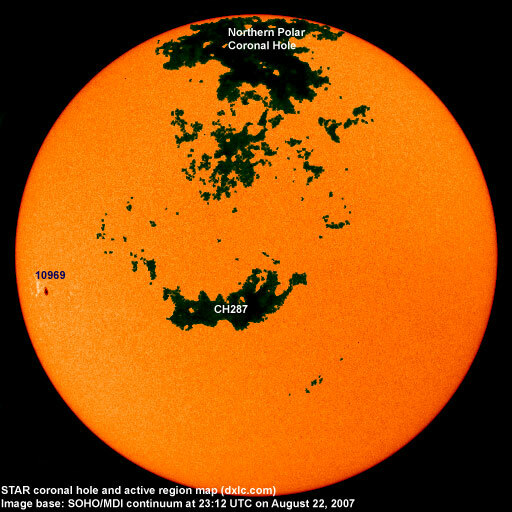 A recurrent trans equatorial coronal hole (CH287) will be in an Earth facing position on August 21-24. Processed SOHO/EIT 195 image at 00:00 UTC on August 23. The darkest areas on the solar disk are likely coronal holes. Long distance low and medium frequency (below 2 MHz) propagation along east-west paths over high and upper middle latitudes is very good. Propagation on long distance northeast-southwest paths is fair. Monitoring remarks from a location near N58E06: August 22: During two fairly brief nighttime car DX sessions at local beaches I first observed many strong signals from Brazil (audio observed as early as 21:15 UTC on 1330 kHz), Uruguay and Venezuela. 1430 Rádio Clube Paranaense was huge in peaks. 1470 kHz was lively with a mix of several Brazilian stations, Radio Cristal (Uruguay) and Radio Rafaela (Argentina). From 02 UTC until just after LSR I was at another site better suited for DXing North American stations. Signal levels were almost incredible with many stations reaching S9+20dB or +30 dB. In particular stations from Newfoundland and New York were strong, but others from further inland like 760 WJR and 1100 WTAM, had good signals as well. 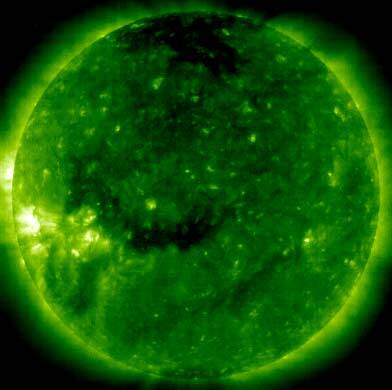 The geomagnetic field is expected to be quiet on August 23-24. Quiet to active is likely on August 25-28 due to effects from CH287.